I took up running these past few years as an extra hobby to allow me some thinking time away from the computer and all my camera gear. I looked into purchasing some of these minimalist shoes both for running as well as for a water shoe for fishing but found that my local stores didn't carry any in stock, and buying shoes online can be risky for fitting purposes. Why not make some myself then? 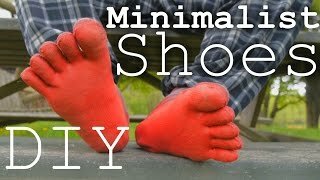 "How To Make Minimalist Running/Climbing Shoes at Home"
Sep 05, 2014 · My son found this video, which I thought was pretty interesting. You don't have to make them in the red/orange. I have a pair of the Vibram KSO shoes.